This is the second part of Walter Bender's "Confessions of a Fundamentalist". The ideals and methods of collaboration and critique embodied in the culture of free software can be a powerful force in the culture of learning. Such a transfer of culture could greatly enhance the education industry and its ability to engage teachers and students: empowering them with both the freedom to act and the freedom to be critical. Criticism of ideas is a powerful force in learning and in fostering economic development; unleashing that is an important part of the mission. It is not about debugging software, it is about the culture of debugging. FOSS can serve as a means towards the goal of constructionist learning. 3. applications run full-screen in a simplified framework; Sugar is simple, transparent, and discoverable, and yet there is no upper bound on the complexity that can be reached. For example, TamTam, a music Activity that is bundled with Sugar (developed by Jean Piché and his students at the University of Montreal), enables a child to progress from playing a single instrument to layering multiple instruments and rhythms to playing music in synchrony with other children to composing music to designing new instruments to programing music (by utilizing Sugar's "view source" capability). Je n'ai fait celle-ci plus longue parceque je n'ai pas eu le loisir de la faire plus courte. / I have made this letter so long only because I did not have the leisure to make it shorter. --Blaise Pascal, Pensées, The Provincial Letters, (1657). Sugar is already in the hands of hundreds of thousands of children who are successfully engaging in learning. Children are resilient, but we need to improve their experience. But they are already being anchored to the idea that learning is about the appropriation of knowledge. Deployment is very hard. Consequently, deployment is being taken seriously: the early-adopter teams in Peru, Uruguay, India, Nepal, and elsewhere have been making great progress and the cooperation between the various deployments is significant and the integration of feedback from the field is of great value. Further, the opportunities for grassroots deployment and community support efforts abound. There are serious challenges ahead; changing the status quo of learning around the world will take time and we'll make many mistakes along the way. It will take time, but we will succeed. Sugar Labs serves as a mechanism for supporting the Sugar community. It is committed to transparency, an open decision-making process with community involvement, a stable mission statement, and documentation. 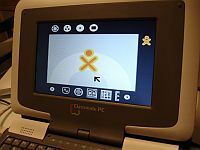 Walter Bender was President of OLPC Software and Content until his resignation in April of 2008 and he is now leading the Sugar Labs project. how big is that XO in that boy's lap? it looks huge. I think you mean "prescriptive", telling others what to do, not "proscriptive", telling them what not to do. David, this will not do. View source is currently quite limited and not well documented, but it exists, and is being extended. It's an optical illusion, one XO closed under elbow (closer to camera and looking large in perspective), second XO open, resting partly on closed XO. 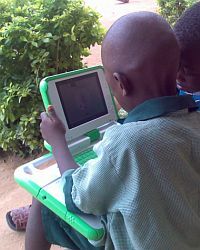 Excuse my annoyance, but I have been a victom of the "we have" versus "we will someday try to have" lie too many times while reading about the OLPC project. The view source feature *as described on the day of the G1G1 announcement* was documented in present-tense. As in "available NOW". Not as in "to be provided at some future, indeterminant, date if we feel like it". Likewise for any number of other cool software features which have now swum out of our ken because the wiki pages that described them are either gone or edited out of recognition. And my decision to be a G1G1 donor was based on those things (along with other factors, including a belief in the *original* mission statement's ideals). I just followed the link for the view source write-up. To a page that was created on March 10th, 2008 and hasn't been changed since. View source (in the Update 1 / 703 build, I presume) only works with chat, browse, etoys and pippy, with terminal email and clock in the "we know how but we didn't do it" status. TamTam is *not* one of those activities. Saying that you *can* view source when the actuality is that *someday it is hoped that in certain special circumstances you will be able to* is simply a lie. It's like telling school children that we can send manned spacecraft to the stars. I enjoy reading this forum but, as my husband will attest, many times I can't help but shake my head. Don't get me wrong the discussions on code and development impact how software is developed and can be tweaked. I know to most of you it is fascinating stuff. However every now and then it may be good to take a small step backwards and view the XO through the eyes of a child. First of all while the sugar interface gave me a moment of pause, when I set the Xo down in front of 4 second graders they had it figured out within 10 minutes. Passing it around and trying new things ,"Just to see what would happen." One of them collected paper and pen and drew out a kinda of flow chart . The diagram looked like a giant eye with eye lashes. He explained the circle as the Eye of the computer and you had to click on the pictures at the bottom so the eye could see them and open them up. My biggest surprise was how my "cell-phone hooked 8th graders" loved them. As the year ended they were talking about how to get Skpe on one . Although I never did get flash to work right -it didn't seem to bother them much. After playing with the XO I took an old computer from the lab and installed Linux on it. My Summer project is going to be to build a computer for my ten year old with more memory the the XO, put sugar on it and try to wrap my mind around using terminal to get Flash to work. ()Although the lack of being able to do WebKInz has been a blessing. But my 10 year old is a science nut and loves the bbc FLASH SIMS so---I will give it another try. So far my kids have had no problems with Sugar at all-something I cannot say about Vista (can you hear my heavy sigh) While we can all debate which tools work the best with a collaborative learning -the fact that there are so many tools and ideas available is...in the end the real beauty in the learning process.. A little of this and a little of that ...all thrown together can make a hearty soup. While we all continue to debate what is better-let's take a moment to rejoice in the fact that this powerful little learning tools has been placed in the hands of children with inquiring minds. As this school years draws to a close-it is a good time to say to everyone involved in the OLPC project- Job well done- and-What's the next step?